At the Outsport Mid-Term Conference in Glasgow, taking place from 2-3 November 2018, the team of the Institute of Sociology and Gender Studies of the Germany Sport University Cologne, led by Professor Ilse Hartmann-Tews, presents the first results of the survey on the experience of LGBTI+ people in sport conducted within the Eramus+ "Outsport" project. Oustport is coordinated by AICS (Italy) and has as its partner Leap Sports (Scotland), VIDC (Austria), Frigo (Hungary), and precisely the German Sport University Cologne (Germany) as scientific pillar. 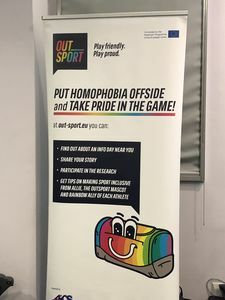 The research, presented to the public of representatives from the press, LGBTI+ and sport organizations and associations and the competent institutions present in Glasgow, is based on the first survey of this kind conducted at European level and has gathered answers from over 5500 participants from the 28 EU countries. The majority of the participants identified themselves as female (48%) followed by a 39% of males and 13% of non-binary. The sample sees participants aged 16 to 78 with an average age of 27 and a strong adherence of under 25. As for sexual orientation, 32% said they were gay, 25% were lesbians, 25% were bisexual and 18% other. The responses show that 9/10 of the total sample considers homophobia and transphobia in sport a current problem. 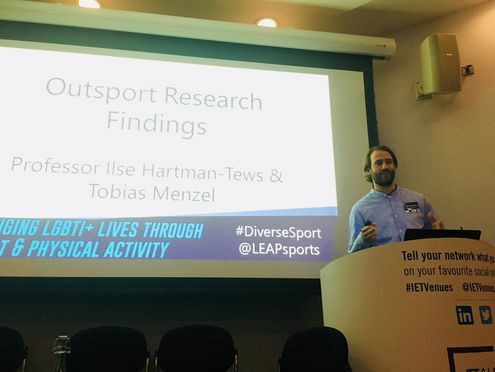 12% of those who regularly engage in sports report negative experiences due to their gender identity and/or sexual orientation in their main sport over the last 12 months. Among these the most frequent are homophobic and transphobic insults and slurs (82%) and discrimination (75%), but the reported cases of physical crossing the line and physical violence (38%) and verbal threats (45%) are also alarming. The percentage of those who have declared negative experiences in the last 12 months rises up to a peak of 31% for transgender women (MtoF) The amount of data collected is considerable and still subject of study and analysis. The full report will be published at beginning of next year.